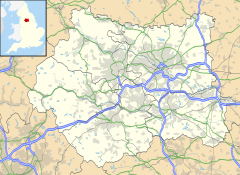 Skelmanthorpe is a village in Huddersfield, West Yorkshire, England with a population of 4,549 according to the 2011 census. It is part of the parish of Denby Dale in the Kirklees borough. Skelmanthorpe was a site in the Survey of English Dialects. The recording taken was notable both because of the rich form of dialect used and because it discussed a local sighting of a ghost. This stood out in the survey, in which most recordings were of villagers discussing local industries. The village was recorded as Scelmertorp in the Domesday Book in the year 1086 AD. The name itself derives from the Norse personal name Skjaldmarr and thorp; thus having the meaning of an "outlying farmstead of a man called Skjaldmarr". Locals know it as "Shat", which appears to be an abbreviation of "Shatterers" which is what the locals were known as. Local labour was taken on during construction of the railway to break or 'shatter' rocks as well as work on the excavations. These unskilled labourers were referred to as Shatterers. The village was likely founded during the Viking invasion in the 9th century, as they moved inland from the North Sea. There is no record of the village in the earlier Roman times. Manors & Berewick. In Turulsetone and Berceworde and Scelmertorp, Alric and Aldene had nine carcucates of land to be taxed, and there may be five ploughs there. Ilbert now has it, and it is waste. Value in King Edwards time 4 pounds. Wood pasture one mile long and as much broad. The comment "and it is waste." is a direct result of the Harrying of the North of 1069. William the Conqueror had difficulties subduing his northern subjects, leading to the order to "spare neither man nor beast, but to kill, burn and destroy" being issued. This left Skelmanthorpe and much of Yorkshire a wasteland for about nine years. During the 1770s, Skelmanthorpe Feast was a riotous affair with bull and bear-baiting and organised dog fights on the village green. A quote from John Taylor, who compiled a biography of Skelmanthorpe-born preacher Isaac Marsden (1807–1882), records that "Public houses were crowded with drunken revellers, who caroused all day and made night hideous with quarrels and disturbances ... Among these scenes of revelry were mountebanks, showmen, fortune telling Gypsies, vagabonds and thieves from every quarter." Skelmanthorpe Feast now happens every year on the field next to The Chartist and across the road from what was the Three Horse Shoes public house and is now shops. In November 1874 a number of skirmishes were fought between the native villagers and Irish navvies. The navvies had been brought in to help construct the railway, and fighting broke out between them and the locals on a number of occasions. This led to the locals being refused work on the line. Causing a small group of locals to throw stones at the navvies, who responded with mattock shafts and spades. The fighting lasted for most of the day eventually ending in the afternoon. Police were called in from Huddersfield but arrived after the disturbances had finished. The first recorded owners of the village were Alric and Aldena in the 11th century, mentioned in the Domesday Book of 1086. Following the Norman invasion of England in 1066 the village was given to Ilbert de Laci by the new king. The de Laci family owned the village for the next 300 years, until through the marriage of Alice de Laci in the 14th century, the village came into the possession of Thomas, Earl of Lancaster. The village remained in this family and after the marriage of Blanche of Lancaster to John of Gaunt, the village became the property of their son Henry (King of England). Similar to many village in the area, agriculture was the primary industry of Skelmanthorpe until the 19th century when weaving took over as the dominant occupation. Many of the older buildings in the village show signs of having been used as weavers cottages in the past. As late as 1890, there were 200 hand looms in cottages in Skelmanthorpe. Number 6, Queen Street was preserved by Textile Heritage Centre, complete with hand loom and all the associated equipment. The owner became frail and a group called the Friends of Skelmanthorpe Textile Heritage Centre was formed in 2011 to assist with the running of the centre. The Friends successfully applied the Heritage Lottery Fund to purchase the centre. The centre is now owned by a charitable trust. The fire station was constructed in 1956. It currently houses one pump and one area support unit along with 21 personnel and is designated as a retained fire station. The village has had its own cricket team since around 1876; the current cricket pitch dates from 1900. The village also has its own junior and senior football teams that play in the Huddersfield leagues respectively. There are two crown green bowls clubs within the village. One club is based at the Windmill Pub on the outskirts of the village and the other club based in the centre of the village. Each club have their own bowling green. Following a petition from local young people fundraising allowed the construction of a small skatepark which opened early 2006. Residents from the area complained about the noise and the skatepark has since been moved. It is now at the bottom of the football field. Parkgate Sports and Community Trust have won the right for a new sports complex to be built at Parkgate. For more than 100 years (from 1879 until 1986), Skelmanthorpe had a railway station on the Clayton West branch line that ran along the northern edge of the village. The line was closed to passengers in 1983 and the track was removed in 1986. The disused trackbed of the former branch line was later used for the Kirklees Light Railway, a minimum gauge railway designed as a tourist attraction, which opened as far as Skelmanthorpe in 1992. Formed in 1843, the Skelmanthorpe Brass Band is one of the oldest brass bands in the country. They currently perform in the First Section of The National Brass Band Championships. During the mid-1970s, Skelmanthorpe was one of the locations used for the filming of the Yorkshire Television sitcom, Oh No, it's Selwyn Froggitt, starring Bill Maynard. Actress Jodie Whittaker is from Skelmanthorpe. She has appeared in films including Venus and St Trinian's and portrays the Thirteenth Doctor in the television series Doctor Who. Actress Lena Headey is also from the area, she starred in St Trinian's with Whittaker and is known for her role of Cersei Lannister in Game of Thrones. The lead singer of the heavy-metal band Saxon, Biff Byford, was raised in Skelmanthorpe and attended Skelmanthorpe Primary School. ^ a b UK Census (2011). "Local Area Report – Skelmanthorpe Built-up area (1119884713)". Nomis. Office for National Statistics. Retrieved 29 November 2018. ^ "British Library. Survey of English Dialects: Skelmanthorpe". ^ Mills, David (2011). A dictionary of British place-names. Oxford: Oxford University Press. p. 422. ISBN 019960908X. ^ ""Shat" name explanation". Skelmanthorpe Village Trail – A scenic self-guided walk around the historic village of Skelmanthorpe. Archived from the original on 25 July 2008. Retrieved 23 June 2009. ^ a b c d Lawton, Fred (1895). Historical notes of Skelmanthorpe & district. Paul Dyson. ^ a b Taylor, John (1882). Reminiscences of Isaac Marsden. T Woolmer. ^ a b Wilkinson, John (2002). Exploring the Upper Dearne Valley. Bridge Publications. ^ "Squash club history". Savoy Squash Club – Information. Retrieved 26 April 2006. ^ "St Aidan's C of E Academy - Home". www.saintaidans.org.uk. ^ "Zoom closure". Pages.zoom.co.uk. Archived from the original on 9 May 2008. Retrieved 17 September 2009. ^ "Home - Saville Road Hall". www.skelmanthorpe.org.uk. ^ "Skelmanthorpe fire station". West Yorkshire Fire and Rescue Service – Skelmanthorpe. Retrieved 16 February 2019. ^ "Skelmanthorpe cricket club history". The Cricket History of Calerdale and Kirklees – Skelmanthorpe CC. Archived from the original on 29 August 2006. Retrieved 26 April 2006. ^ "Skate-park petition". Annual Report of the Denby Dale Parish Council 2004–2005. Archived from the original on 17 May 2008. Retrieved 23 June 2009. ^ "Skate-park". December minutes of the Denby Dale Parish Council 2008. Archived from the original on 9 July 2011. Retrieved 23 June 2009. ^ Lavigueur, Nick (7 October 2014). "Royal approval for Skelmanthorpe sports complex project". Huddersfield Examiner. Retrieved 16 February 2019. ^ "Station Name:Skelmanthorpe". Disused Stations. Retrieved 17 July 2017. ^ "Band history". Innovate Skelmanthorpe Band. Retrieved 23 June 2009. ^ "Band standings". Regional Contest Skelmanthorpe Info. Retrieved 23 June 2009. ^ "Filming Location". Yorkshire on Film and TV, Northern England. Retrieved 30 April 2006. ^ "Yorkshire's Doctor". Welcome to Yorkshire. Retrieved 14 September 2018. ^ Campling, Katie (16 January 2008). "Lena gets ready to terminate TV ratings". Huddersfield Daily Examiner. Archived from the original on 6 March 2012. ^ Glover, Chloe (30 August 2014). "Saxon's Biff Byford: He's sold 15 million albums, influenced Metallica and toured the world - but did you know he was from Huddersfield?". Huddersfield Examiner. Retrieved 16 February 2019. ^ Tuckey, BIll (1 August 2010). "God gave rock'n'roll to you: Will heavy metal be a religion on the". The Independent. Retrieved 16 February 2019.